I have mentioned Lucretia Mott's name in this blog more times than any other--you can click on the label "Lucretia Mott," below, to see where and when her name has come up in the last eleven months. Born on Nantucket Island in 1793, Lucretia Coffin Mott would play an integral part in key social movements for more than fifty years. In 1804, Lucretia Coffin entered a Quaker boarding school in New York, where she became a follower of Elias Hicks, an abolitionist. She would eventually become a teacher at the school, where she learned that women were paid less than men. And while at the Nine Partners school she met and married a fellow teacher, James Mott, in 1811. By 1821, she had become a Quaker minister, speaking out on behalf of reform within the Society of Friends. She also became increasingly public in her opposition to slavery. But however close she became to abolitionists like William Lloyd Garrison, she had to face the reality that women were formally excluded from abolitionists groups. So, in 1833, she became one of the founders of the Philadelphia Female Anti-Slavery Society. In 1837, as we have seen, she helped to organize the First Anti-Slavery Convention of American Women--along with women like Angelina and Sarah Grimké, she addressed audiences of men and women, and for all these women, speaking "promiscuously" caused a great deal of public opposition. Two further conventions followed, one in 1838 and another in 1839. There was so much opposition--not only were women organizing and speaking, but the convention was integrated, including black and white women and men--that a mob rioted and destroyed Pennsylvania Hall during the 1838 convention. In 1840, Mott attended the international World Anti-Slavery Convention in London, one of six female delegates--the male delegates, however, opposed opening up their convention to women and voted to exclude their participation, so Mott was recognized only as a visitor, not a delegate. While there, Mott and Elizabeth Cady Stanton, another unseated woman delegate, decided that, on their return to the United States, they would organize a convention for women's rights. Their decision culminated, eight years later, in the Seneca Falls Convention. Mott spent the rest of her life advocating for the social causes she believed in. A committed pacifist, she opposed war with Mexico and the Civil War, attended meetings of the New England Non-Resistance Society, and was vice president of the Universal Peace Union, founded in 1866. In 1870, she was elected president of the Philadelphia Peace Society. She attempted to heal the breach between suffragists after the Civil War, when the question of whether black men should gain the vote before women did, fractured the movement. She was elected the first president of the American Equal Rights Association, advocating for universal suffrage. Along with Stanton and Susan B. Anthony, she helped to create the National Women Suffrage Association. In 1876, at the time of the American Centennial, she presided at the National Women Association meeting in Philadelphia; two years later, she was at the thirtieth-anniversary of the Seneca Falls Convention. Mott refused to claim the moral superiority of women but was instead dedicated to achieving equality for all of America's disadvantaged and disenfranchised, including Indians, women, slaves, and free blacks. Increasingly libertarian in her religious interpretations, Mott grew to believe that a new spirit was at work in the world that demanded active involvement in reform. An enormously inspirational speaker and a tireless organizer, Lucretia Mott was one of her country's earliest, and most radical, feminists and reformers. For Unger's essay, for American National Biography Online, click here. For her biography at the National Women's Hall of Fame, click here. 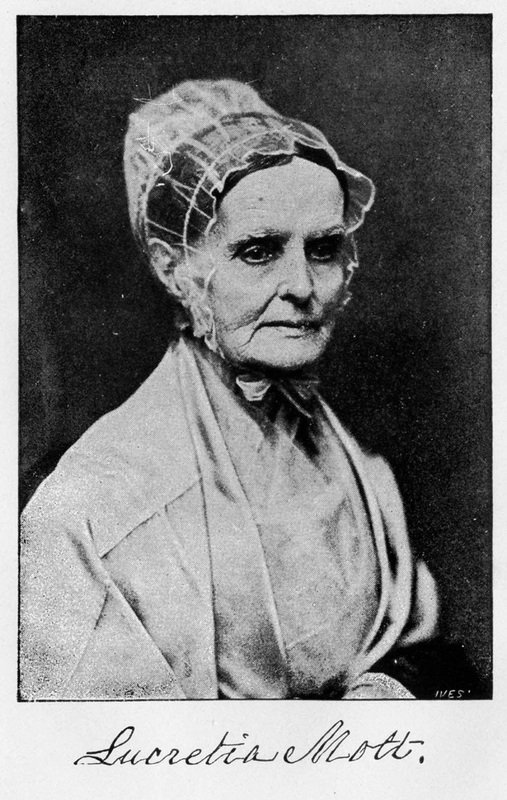 There are several full-length biographies, but I like Carol Faulkner's biography of this "radical egalitarian": Lucretia Mott's Heresy: Abolition and Women's Rights in Nineteenth-Century America.